As a Senior Lecturer at the UNE School of Law, Sarah Bailey had a profound impact on me. She reminded me that the people I admire most in life are those who have to struggle to achieve success. Like many of the UNE School of Law’s students, she was not handed all the tools she needed to succeed on a platter. Instead, Sarah relied on her intelligence, resilience, determination and pure grit to achieve academic success. Her story reaffirmed why I love being an academic at the UNE School of Law. When Sarah was 18 years old, she found herself in Newcastle with no money, no job and no family support. Sarah didn’t have the marks or the financial means to go straight to university. Instead, she started her educational journey by enrolling in a Diploma of Natural Resource Management in Newcastle. Sarah describes the first few months of the course as tough. She struggled to find affordable accommodation and pay her expenses. There were some weeks Sarah could not attend her classes as she simply did not have the money to pay for the public transport to reach the university campus. After successfully completing her diploma, Sarah enrolled in a Bachelors’ Degree in Environmental Science. During her university studies, Sarah worked full time in various roles which were related to environmental protection and mining. Then in 2007, Sarah received her first manager’s job in heavy industry and mining. After realising how heavily regulated the mining industry is, Sarah decided to enrol in a law degree. When Sarah was looking for a university to complete her law degree she had two requirements. She needed a university which allowed flexibility. She also wanted to get a degree from a highly regarded university. UNE ticked both these boxes! Not long after she started her law degree, Sarah’s first baby came along. Not surprisingly, Sarah was forced to become more effective with her time management. One way she juggled her various tasks was to listen to podcasts of her law lectures on her long commute to and from work. In 2011 Sarah was thrilled to get a job with BHP. Once BHP realised that Sarah was completing a law degree, they chose to support her by funding her studies and providing her with study leave entitlements. 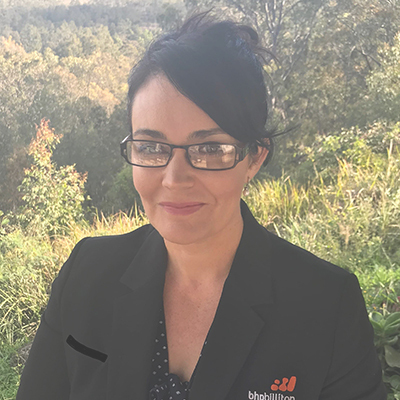 Her insightful managers knew how useful a law degree would be to her role as an Approvals Manager within the iconic Australian company.Unsurprisingly, Sarah is still happily working at BHP. She has been promoted and is now the NSW Principal- Approvals and Land Access. Within this role, Sarah completes all sorts of tasks such as providing regulatory advice to the business in relation to approvals and land access requirements. She is also involved with the remediation of the old steel works site in Newcastle. The steel works formally closed in 1999, however, the team at BHP have worked hard in recent years to restore its pristine environment. Works have included contaminated land rehabilitation (now completed) and land divestment. They have also constructed substantial wetland habitat in Ash Island National Park. This is the perfect habitat for the Green and Golden Bell Frog. These remediation efforts have clearly worked as the threatened species of frog have started breeding! Sarah has no regrets about completing her law degree with the UNE School of Law. She notes "I always felt this was something I needed to do for myself. As hard as things got from time to time, the feeling of walking out of an exam knowing that despite all of the obstacles during the trimester such as, sick or non-sleeping kids, long work hours, family and social events, new babies, holidays etc, that I managed to work hard, maintain focus and stay the course.". Thank you Sarah for sharing your story with us!